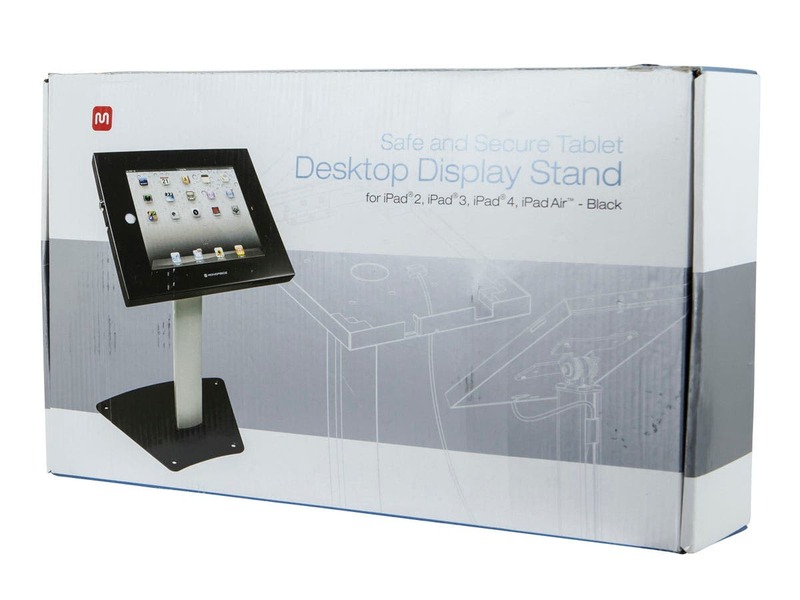 BEST ANSWER: This Safe and Secure Tablet Desktop Display Stand has a fixed height. No, only the angle of the tablet. It's extruded aluminum so you could cut the pedestal down shorter and put it back together but you can't make it taller. How tall is this stand? BEST ANSWER: Hello, thank you for your inquiry. While we do strive to include all measurements and diagrams on the product page, if there is a specific measurement you are looking for, please email us at tech@monoprice.com so we can provide you with the appropriate specifications you are looking for. I hope this helps, thank you! This response doesn't really help - why not just put the measurements here instead of saying they're on the product page (which they're not)? Is there space to keep the case secured and plug in a lightning cable as well? BEST ANSWER: Yes. I'm using an iPad 2 with old style apple connector and even it has space in side the locked compartment and the cable come out the back and runs down the post hidden. Is this compatible with the Apple Ipad Air2? Not sure if there was a size difference from the Air to Air 2. BEST ANSWER: Stand would only hold the original iPad Air. I've misplaced the keys to this stand. Are they proprietary or can I get them at any computer or office supply place? If I can, what should I ask for? Does this work for 7-8 inch tablets? BEST ANSWER: Hello, thank you for your question. 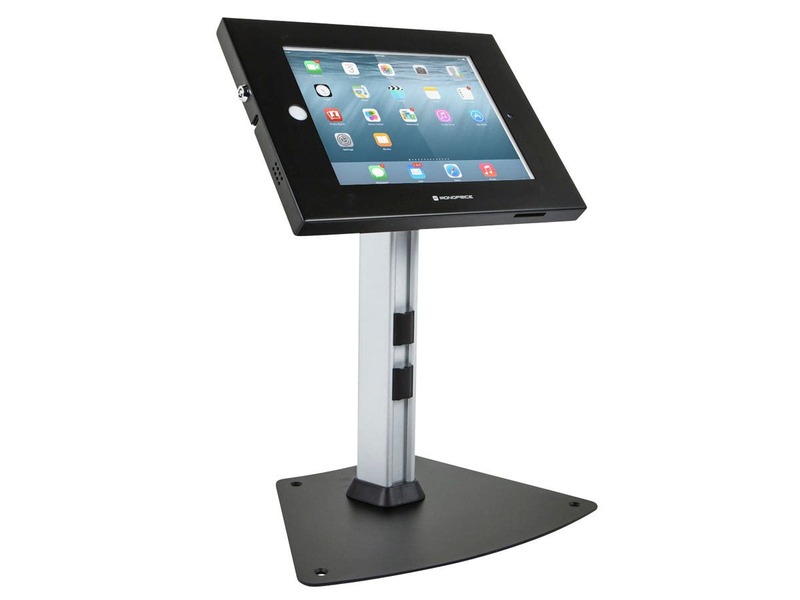 This iPad stand is was specifically designed for use with the iPad 2, iPad 3, iPad with Retina Display and the iPad Air. Since we have not tested it with tablets of other dimensions, we cannot guarantee it will work or recommend it for that use. is there an opening to plug a card reader into the head phone jack? BEST ANSWER: Thank you for your question. Unfortunately there would not be an opening for the headphone jack. I do apologize for any inconvenience. Will it work with a iPad Pro 9.7? Is it compatible with the new iPad? BEST ANSWER: Yes we just bought a new iPad and it works just fine. does this work well with the new Ipad Air 2? Will this work with an Ipad 5? Is the camera still usable? Will this work w/ a Kindle Fire 10? I just purchased the latest 6th Gen iPad. Will this stand work for this iPad? Great for POS. The tilt hinge is perfect for when customers need to sign. Great and nice for what I need it for. Easy to assemble. Lock not so secure :( (hence one star loss). Should keep an eye on display in public place. I don't think it can hold up to a small struggle. iPad Air is too thin? PRO: allows you to flip the iPad to the costumer in POS set ups. Looks good and nice i secure. This works great at my business on our sales desk. We use an iPad for our POS and employee clock so it is used every day. Purchased this for our softball league to use in the snack bar. We will begin accepting credit cards using an iPad and Square card reader. 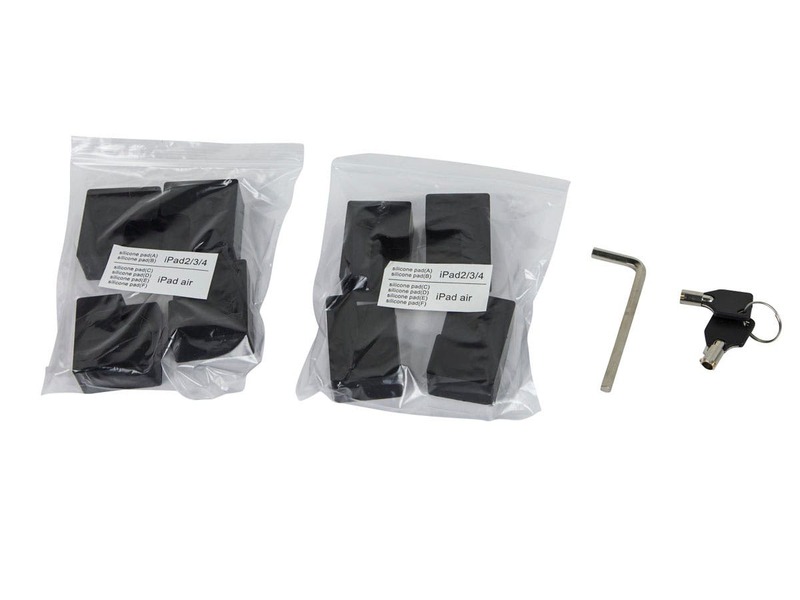 Assembly is easy and straightforward. If your card reader attaches to the headphone jack you will need to purchase an extension to bridge the gap from the jack to the edge of the frame. The stand is sturdy and seems to be well built. We have not used in live transactions yet so I cannot comment on the pros and cons in usage. CONS: Need to buy an additional solution if using as a point-of-sale device with a card reader. 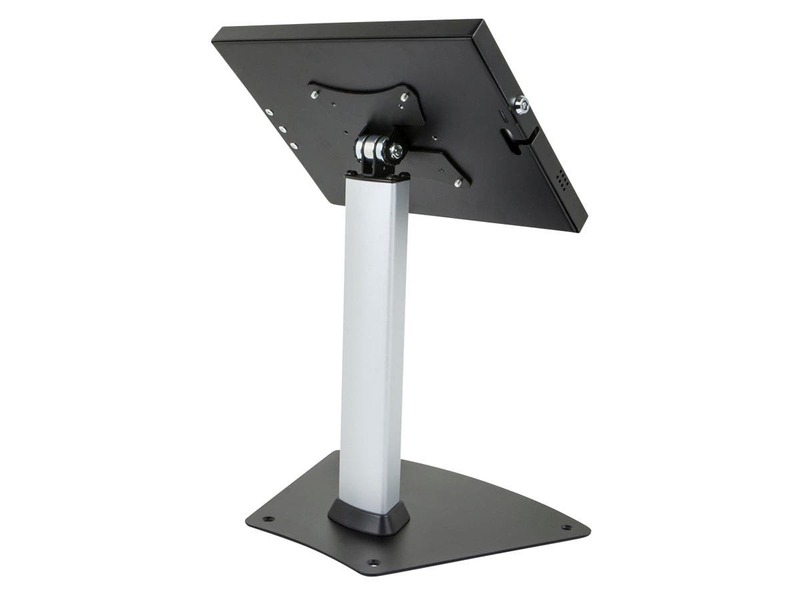 I've been using this with an ipad2 to display a video loop at trade shows. It works great, very durable and affordable. It's nice having a lock and access to the charging port with a built-in way to conceal the charging cable. CONS: "Monoprice" logo is very front and center, which I find a bit distracting. Would be nice if they offered a no brand option. This is a surprisingly heavy duty stand. Very good for permanent installations. PROS: Heavy Duty. Secure. Looks Good. Great product for the price. CONS: There is a plastic clip provided that you can use to cover access to the home button when the iPad is in the stand, however it still has the marks from the mold on it (it isn't completely smooth and has a small hole in the middle) which draws away from the beauty of the stand. Also, it would be nice if the monoprice logo was not on the front.